The October presidential election is key to Brazil’s future. For the first time, the new president could come from outside the established parties that have ruled the country for almost 30 years of democracy. Social media is quickly turning into an important battleground in the dispute for people’s votes as the Brazilian legislation regarding the elections restrict the free political advertising on television of many of the candidates. Thus, candidates take advantage of the free and unlimited space provided by social media, increasing their role in the way candidates communicate with the electorate. So AJA is following each candidate on Twitter using proprietary technology AFFINIMAP© to produce in depth analysis of their situation. Every week, we produce a much-needed insight on what the candidates think and what are their plans. In addition to the report, we also offer the opportunity to access an interactive map to understand how each candidate engages with voters and opponents. If you would like to subscribe to our weekly analysis and the interactive map, please contact us. Receive alerts whenever a new report is issued and valuable sneak peeks by providing your e-mail address below. Every week, our software collects social network data published by the candidates and the reactions about their posts. 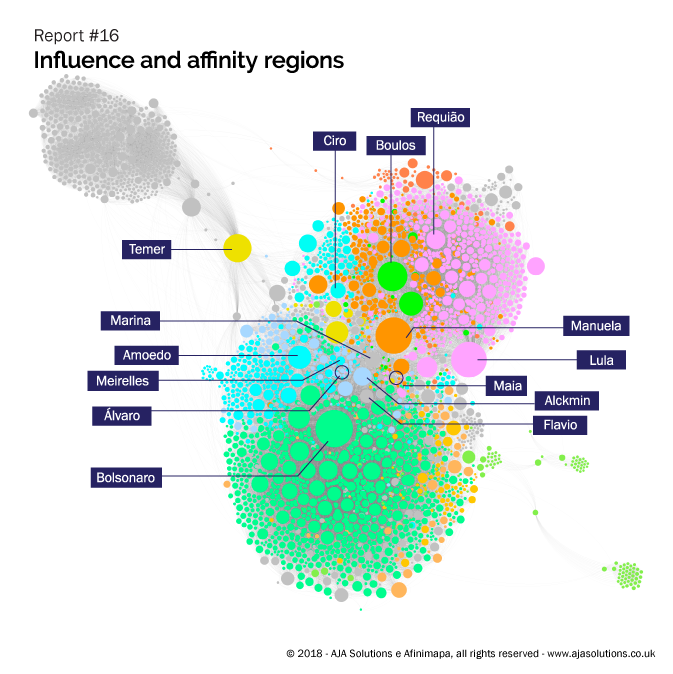 Combining our proprietary technology Affinimap© and human brain, we build a network interaction data visualization and then analyse their message and their relevance in the election ecosystem on Twitter. We measure each candidate’s relevance among voters and are able to indicate forward trends. We analyse their main messages and the impact they are having on the candidates’ popularity. We identify which ideas are resonating among voters, as well as the efficacy of the candidates’ communications strategies. Our reports summarize the data through rich infographics. 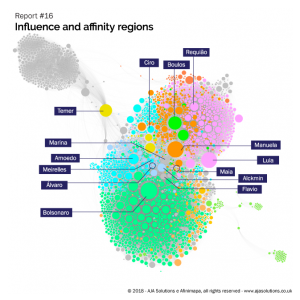 As a subscriber, you’ll be provided with an interactive social network map in order to explore a massive amount of data – all the texts, images and links on the database – and see the interactions for yourself. Subscription 1: You will have access to the complete set of weekly reports as well the interactive maps until the 1st round of the presidential election on 7 October.